The first season of Big Finish’s The Lost Stories concludes this approximation of an alternative season twenty-three with ‘The Macros,’ a story written by the legendary Ingrid Pitt. As the TARDIS materializes aboard the disintegrating USS Eldridge following the ill-fated Philadelphia Experiment, the Doctor soon realizes that the problem is stemming from the planet Capron in another dimension, one with a tyrranical ruler whose horizons and intentions are significantly expanded as the Doctor arrives to explain the situation. 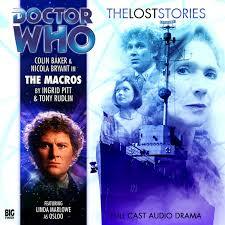 Unfortunately, ‘The Macros’ is a decidedly average story in just about every way, unable to make the most of the real-life mystery behind the ship that forever vanished following an invisibility experiment and failing even to explain the nature of the title which is not mentioned once throughout the entirety of the story. There are semblances of some very clever ideas in play, and the notion of the ship being wedged between two dimensions is a strong basis for a Doctor Who story and certainly carries far more intrigue than the official story of the ship being renamed and given to the Greek Navy. With the smaller universe drawing upon the energy reserves of the larger universe through an unstable rift, an intriguing backstory for the power-hungry Osloo is also offered. Similarly, the fact that the Doctor and Peri for once try to go back to Washington, DC before the experiment to change history speaks to the danger the situation poses, and the fact that the Doctor is unable to return the remaining crewmembers to Earth at a time before 2010 is inherently fascinating, though sadly the latter aspect remains tantalizingly unexplored as a true source of potential drama. Despite these clever ideas, though, ‘The Macros’ insists on using too many clichés without taking any real chances to stand out and be anything more meaningful. The Capron storyline quickly devolves into a rather straightforward affair of rebels rising up against leaders, and the time loop trappings of the Eldridge are hardly used for anything more than creating an obstacle for the Doctor that later forms the basis of a betrayal. As written, every significant development is done solely for the benefit of plot development without bolstering characterization in any significant fashion, creating a strange sense of detachedness around the entire procedure. Every action makes sense and the story logically flows from one point to the next barring the cliffhanger which abruptly changes the trajectory of the story and telegraphs the resolution, but there’s no inner emotion or motivation written despite strong performances to truly make any of the actions resonate. After a strong run of stories for character progression for both the Sixth Doctor and Peri, ‘The Macros’ is definitely a step backwards and again plays it safe with the portrayal of its leads. The Doctor is strangely passive and submissive, and Peri, though certainly known for a propensity for impulsiveness, suffers from a momentary lapse of judgment so profound at the cliffhanger that it seems out of character even for her and detracts from what is otherwise a decently flattering story for her more heroic tendencies. Unfortunately, this kind of disjointed characterization is mirrored by the fairly disjointed plot that never quite cohesively meshes as a whole. Despite the usual strong performances, direction, and sound design, ‘The Macros’ is a rather flat ending to what has been a decidedly entertaining and progressive season of stories overall.